1. Preheat oven to 400 degrees. Line baking sheet with tin foil. 2. Mix all ingredients together. Shape into golf ball sized meatballs and place on tin foil. 3. Bake for approximately 16-18 minutes. 2. Mix almond meal, coconut, and spices together in a bowl. 3. Crack egg into bowl and whisk. 4. Dip shrimp into egg and then coat with almond coconut mix. 5. Place on greased cookie sheet and bake for approximately 8- 10 minutes. This is one of those recipes that you can really allow freedom for ingredients and measuring- don"t be shy to experiment!. 1. Heat coconut oil with garlic in pan. Sear pineapple chunks and then remove and set aside. 2. Add cauliflower rice first if frozen. If not, add in veggies first to cook down and then follow with the raw cauliflower. 3. Whisk eggs in a bowl and add some salt & pepper. 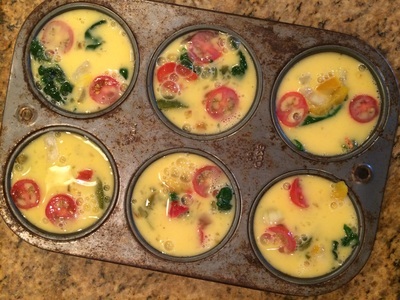 Spread cauliflower and veggie mixture to outside of pan and pour in the eggs. 4. Scramble the eggs, once cooked mix in all the veggies from the edge of pan. 5. Add the pineapple back in and top with green onions to serve. 1. In a large sauce pan, heat oil and garlic. Stir in carrots, celery, and onion. Cook for about 5 mins to soften. 2. Add in ground chicken and spices. Cook for about 10 minutes or until browned. 3. Mix in tomato paste and buffalo sauce. Let cook for about 5 more minutes. Serve on zucchini noodles, on top of a salad, in lettuce boats, sweet potato buns, or regular hamburger rolls. 2. In food processor, blend cashews. Add in chickpeas and give a rough blend. 3. Add water, garlic, olive oil, parsley, and spices. Blend together. 4. Using a spatula, fold in the red onion and spinach. Spoon mixture into pepper halves. 5. Bake in oven for approximately 30 mins. With 10 minutes remaining, sprinkle feta on top. Delicious paired with a greek salad: romaine/ butter lettuce/ spinach topped with tomato, cucumber, olives, artichoke hearts, red onion, feta, and olive oil and red wine vinegar dressing. 1. While quinoa is cooking, prepare salmon salad by adding yogurt, sriracha, sesame oil, salt, and pepper to the canned salmon in a bowl. 2. Layer all ingredeints in a jar or toss in a bowl. 1. Put everything into the food processor and pulse together. 3. If its super dry, you can add a little bit of water or more coconut oil. Mixture should be wet/ blended enough that it sticks together. Using your hands, form into small balls. 4. Put in fridge to firm up. Keep in air tight container in the fridge. I love coming up with ways to use leftovers, and this was relish for breakfast! Would be great with nut butter on top, yogurt, or banana slices! 2. Melt coconut oil in glass baking dish and swirl around so it covers the bottom, its okay if theres excess. 3. Add in nut butter, almond milk, egg and whisk together with a fork. Add in spices and stir. 4. 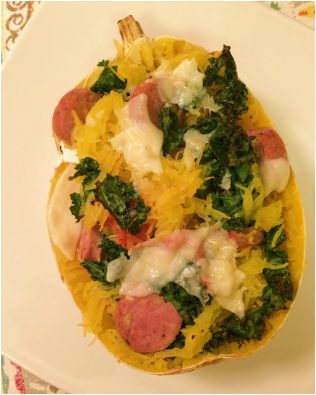 Fold in spaghetti squash so that everything appears evenly covered. To prevent #saddesklunches, I'm always looking for new takes on classic recipes that are healthy and delicious! 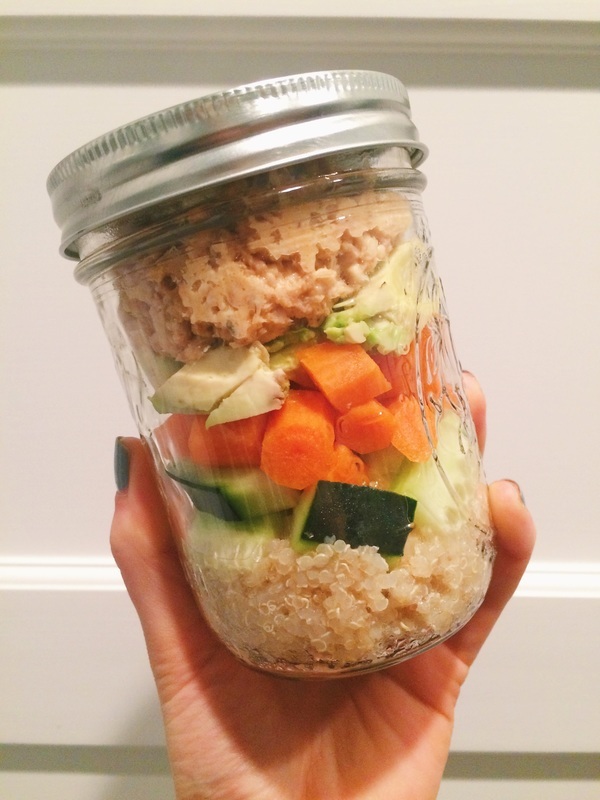 I recommend this recipe for your next meal prep day! I made four salads with this. 1. Microwave artichoke hearts (and spinach) and prepare chicken (or buy pre cooked). 2. In a small bowl, mix together the yogurt with all the spices. 3. Chop up the chicken, spinach, and artichokes and put into a medium sized bowl. 4. Mix in the yogurt mixture. Add more seasoning if necessary. 5. Enjoy as a sandwich or over a bed of greens. 1. Preheat oven to 400 degrees. Cut squashes in half, remove seeds, rub with some coconut oil, salt, and pepper, and roast in oven for approximately 45 minutes. 2. While squash is cooking, bake sausage in oven for about 10-12 minutes. 3. Saute kale with some coconut oil, salt, pepper. Remove and keep in side bowl. 4. Remove squash from oven. Let cool for about 5 minutes. Using a fork, pull into strings into a bowl. Keep the shells to refill. 5. Layer the filling back into the sqush peels. First add some sauce, followed by spaghetti squash, some kale, some sausage, and keep repeating until full. 6. When ready to eat, put your oven at 375 and put boats back into the oven for 20 minutes. Shave some parmesan on top and bake for a few minutes until melted. 1. Trim any access fat off the pork shoulder and place in slow cooker. 2. Pat salt evenly across the meat Pour water in base of slow cooker. 3. Let cook on low for about 10 hours. 4. Preheat oven to 400 degrees. Slice sweet potato into thin rounds, toss with OO/ Salt/ Pepper and place on a baking sheet. Bake for 30 minutes (flip half way through). 5. Mix all the slaw ingredients together minus the bag of prepackaged slaw. Once you have the dressing you can pour that on top of the slaw and mix together. 6. When meat is done remove from slow cooker and use two forks to shred the meat into strands. This should be very easy if it is fully cooked. Healthy Baked "Fish & Chips"
2. Prepare carrots and parsnips. Toss with OO, Salt, pepper and place on baking sheet. 3. Put in oven for approximately 40 minutes. 4. While the veggies are in the oven, mix all the fish ingredients together except for the fillet. 1. Prepare barley by putting water and barley in a pot. Bring to a boil and then reduce to low and let cook for approximately 25- 30 minutes. 3. Add curry powder to barley on stove when there is about 10 minutes left. 5. Once barley is done remove from stove and mix with all ingredients in a separate bowl. 1. Prepare all your veggies if roasting. 2. Heat beans if desired. 3. Mix everything together in a bowl! The possibilities are endless with taco salads- there are tons of different veggies, meats, beans, sauces, etc that you can put together so don't be afraid to try new combinations! 1. Chop cauliflower into chunks and then put into food processor. Pulse until well blended. Pour into large bowl. 2. Chop broccoli and pulse in food processor. Add to cauliflower. 3. Add carrots, celery, raisins, almonds, and sunflower seeds to bowl. Mix everything together. 4. In a small dish, add all wet ingredients for dress. Mix together and then add in salt and pepper and mix together. 5. Add dressing to salad and mix until evenly distributed. Let marinate for at least 30 minutes before eating. I split this into 4 salads. 1. Preheat oven to 400 degrees and bake sweet potato for one hour. 2. Remove skin from potato and mash in a bowl. Turn oven down to 350 degrees. 3. Add milk, coconut oil. Follow with all the spices and baking soda/ powder. 6. Bake for approximately 20 minutes. 7. Let cool and then remove from pan and enjoy! Another lighter/ healthy take on a beloved classic! A dish that they WHOLE family will love- even your veggie skeptical little brother. 2. In one bowl, mix together cooked quinoa, thyme, and mozzarella. Set aside. 3. 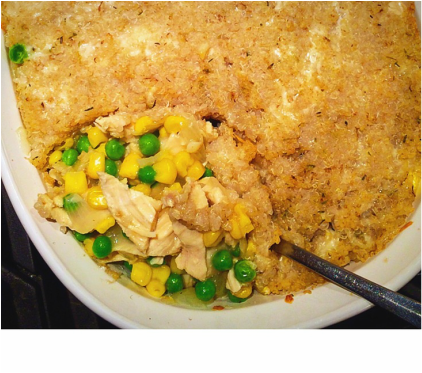 In a sperate bowl, whisk together chicken broth, milk, flour, salt, and pepper. Set aside. 4. Bring a saucepan to medium heat on stove and add olive oil, garlic, and onions. Let cook until translucent. 5. Slowly stir in the broth/ milk/ flour mixture. Let it come to a boil and then reduce to low heat and allow time to thicken, stirring occasionally. 6. Once broth is thick, mix with vegetables and chicken in a bowl. Layer the mixture into a 9 bu 17 baking dish. 7. Spoon quinoa mixture on top and spread evenly. 8. Bake for 25- 30 minutes. (You can freeze if not going to eat right away). The solution to breakfast, lunch, AND dinner. Feel free to change up the insides. 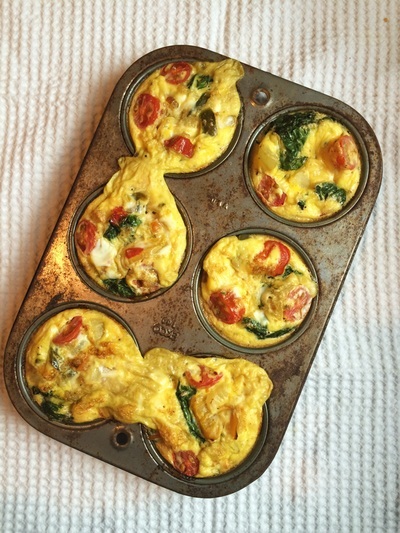 I made six muffins but you could easily make more in one batch just adjust number of eggs. 2. Prepare filling. Sautee veggies on stove or microwave if frozen- muffins will taste better if filling is cooked and not raw. 3. Whisk together eggs. almond milk, salt and pepper. 4. 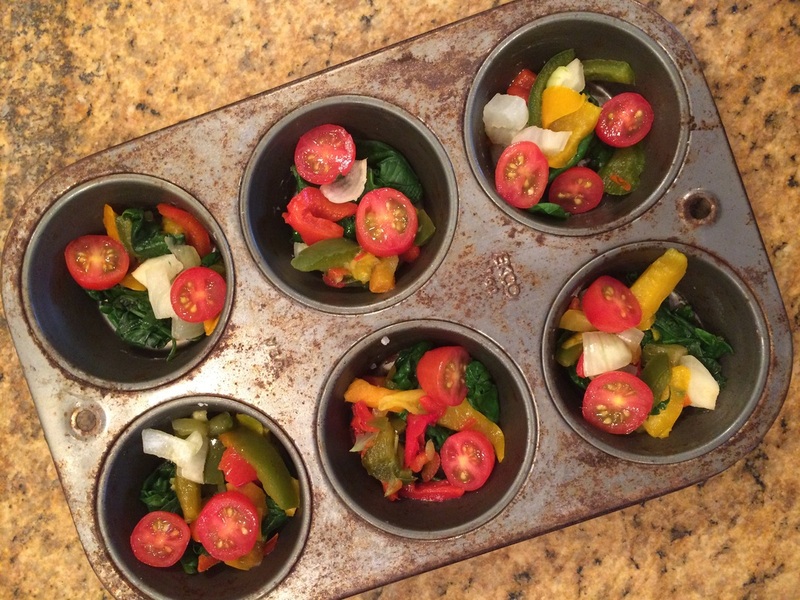 Grease muffin tin with coconut oil and add veggies to cups. 5. Pour ego filling into muffin tin. 6. Bake for approximately 18 minutes. Test with a toothpick to make sure they are cooked through. 7. Let muffins cool for 10 minutes and then remove from tin and store in fridge. You can freeze if you are not going to eat them within 4 days. 1. Add ground turkey to base of crock pot. Its important to put it at the bottom if using raw meat because it will cook first. (optional to brown first). 2. Add spices; garlic, thyme, oregano, red pepper flakes. 3. Pour can of tomato paste on top of meat. 4. Add vegetables; carrot, celery, onion. Follow with tomatoes and dash of salt/ pepper. 5. Let cook on low 6 to 8 hours. Add basil for last 30 minutes. To cook zoodles: spiralize zucchini and sauté with coconut oil for 3-4 minutes. Drain and let sit for a few minutes before mixing with sauce and serving. 2. Mix oil, garlic, syrup, and mustard in a dish. 3. Pour sauce over carrots and chickpeas, make sure everything is coated. 4. Roast in the oven for approximately 20 minutes. 2. After carrots and chickpeas have cooled slightly, place over greens. ​3. Top with slivered almonds and cranberries. Divide all ingredients into six and place in quart size freezer bags. Put in freezer. When ready to eat, thaw in fridge overnight. Divide all ingredients (except water/ chicken broth) by four and put in quart size freezer bags. Remove air when sealing and place in freezer. Thaw overnight. Add 1 cup (if you didnt divide individually, use 4 cups) water to slow cooker with contents, cook on low for 6- 8 hours. Add pasta noodles for last 30 minutes of cooking if desired. Divide all ingredients by four and put in quart size freezer bags. Remove air when sealing and place in freezer. Add 1/4 cup water (1 cup if entire recipe) to slow cooker with contents, cook on low for 6 hours. Drain from water and enjoy plain or as fajita filling- also delicious over brown rice or quinoa! Divide all ingredients (except water) by four and put in quart size freezer bags. Add 1/4 cup water (or 1 cup if entire recipe) to slow cooker with contents, cook on low for 6 hours. **with individual sizes, I recommend using a 2 quart crock pot. 1. Wash and chop the kale into smaller pieces. 3. Peel oranges and slice horizontally. 4. Open up the pomegranate and remove the seeds. 5. Roast pecans on stovetop for about two minutes. Add honey and roast for 30 seconds more. 6. Add all ingredients to the kale and top with some salt and pepper. 1. Mix all ingredients (except for optional mix ins) in a blender until smooth. Add a little bit of almond milk if mixture is really chunky. 2. Heat griddle and lightly coat with non-stick spray/ butter/ coconut oil on medium heat. 3. Drop batter on griddle, add any toppings, and let brown. Flip and let other side brown. 4. Repeat with all batter. Buying granola from the grocery store that is actually healthy compared to what advertising wants to trick you into believing can be tough so I decided to make my own just in time for the holidays! 3. In a saucepan on medium low heat, warm all of the wet ingredients. Slowly pour in dry ingredients and stir together. 4. Spread the mixture on a baking sheet and put in oven. Let bake about 18 to 22 minutes. Stir hallway through. Begin checking for browning around 15 minutes to prevent over baking. Greek yogurt is the absolute best replacement to make a dish healthier! This feta and green onion dip was delicious with homemade sweet potato chips but would also be great with veggies like cucumber slices and baby tomatoes or with pita chips! 1. Use a fork to make sure your feta is really crumbled. 2. Mix all ingredients together and enjoy! I love buying a big bundle of kale in the beginning of the week and using it for EVERYTHING- breakfast eggs, salads, dinner, etc. 2. Cut spaghetti squash in half, scoop out the insides, rub with some coconut oil, add some salt & pepper, and place face down in a glass baking dish. Add 1/4 inch of water. 3. Bake squash in over for approximately 40 minutes. 4. When the squash is 3/4 of the way done baking, prepare kale by sautéing with coconut oil and some garlic in a pan on the stove. Once it begins to darken in color, add some tomato slices. Keep on low heat. 6. Remove squash from oven and using a fork, scrape insides into the pan and mix with the kale and tomatoes. Slice sausage into medallions and mix in.